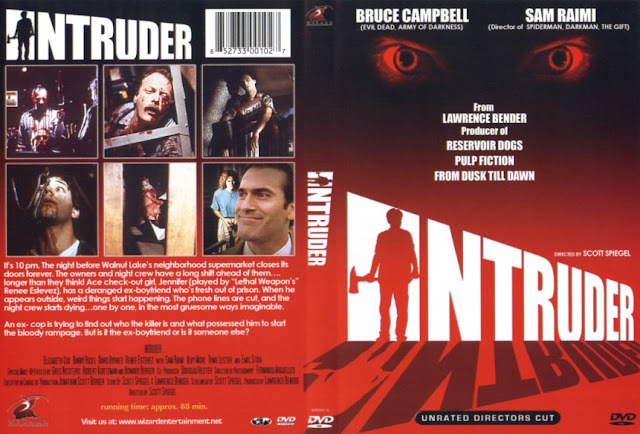 Intruder is one of those forgotten 80's slasher movies. That's a shame too because it's actually a really interesting take on a played out genre. It's about an overnight stock crew of a grocery store getting butchered. It's a whodunnit. You're led to believe one person is responsible for the grisly murders until the final reveal. Director Scott Speigel (who had previously worked on Evil Dead 2 with Sam Raimi) gives us plenty of interesting visuals and some amazing death scenes that gore hounds will love. If you've ever worked in a retail establishment that has a cardboard bailer in the stockroom, you've no doubt wondered what it would be like to use that to murder someone. What? I know I can't be the only one. Anyway, in this one, we get to see it! There's plenty of suspense and gore, but there's also plenty of laughs. At one point, the killer beats someone with a severed head. Yep. It's that kind of flick. Sam Raimi also has a rare acting role in this one. He does a good job with it too. It's a shame he didn't do more acting. Bruce Campbell also has a bit part towards the end. Don't be fooled by his name in large print on the front of the box or the image of him on the back of the box. He's in it for about 10 seconds. The movie doesn't suffer because of it though. This is just a fun slasher with a good premise. If you're looking for something in the vein of Evil Dead 2, give Intruder a try. After all, a lot of the creative forces behind that cult masterpiece also have a hand in this one. And it feels that way. Good stuff. If you're interested in learning some more about Intruder, check out this video review I did of the flick several years back. Just be warned, there's some spoilers in it!